Have you seen purple pipes around your town or neighborhood? 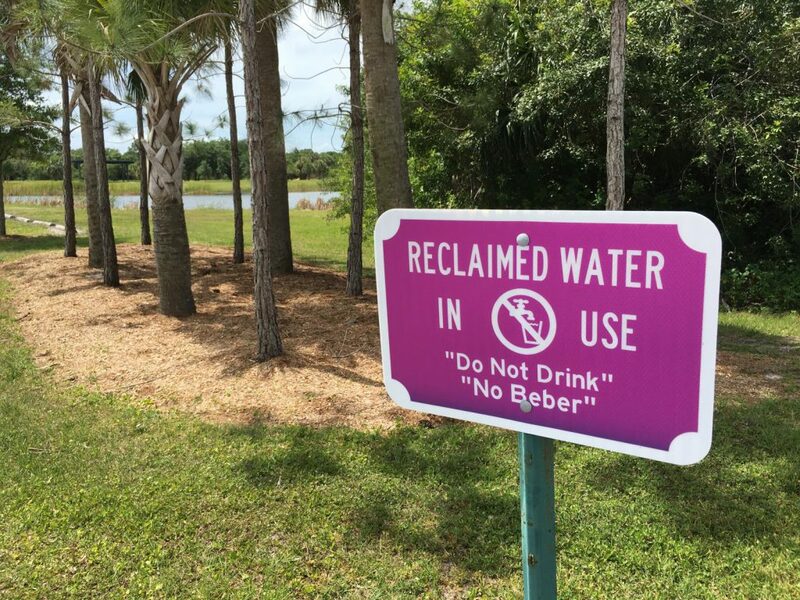 What about signs that read, “Reclaimed Water. Do not Drink,” like the one below? Reclaimed water is treated wastewater that is reused in a variety of ways, but it is mostly used in public access areas for irrigation of residential areas, golf courses, parks, etc. According to the Florida Department of Environmental Protection (FDEP) Water Reuse Inventory, Florida used 760 million gallons per day of reclaimed water in 2016. Reclaimed water is treated to meet standards set by the Florida Administrative Code, but it differs from drinking water or rain water. It contains nutrients and salts, and depending on the level of treatment, there can be other biological, physical, or chemical constituents. For this reason, reclaimed water should not be used for drinking, showering, or cooking. At minimum, water is treated with a secondary treatment and basic disinfection. Some treatment facilities also treat with an advanced treatment. More information about reclaimed water and the treatment process can be found here. Why is reclaimed water being used for irrigation? The main benefit of using reclaimed water is it replaces the use of potable drinking water and conserves our supply of fresh water. However, because it contains nutrients, it should be managed properly to avoid downstream environmental impacts. Often, less fertilizer is needed when irrigating with reclaimed water. Conduct a soil test to determine your fertilizer application needs, especially if irrigating with reclaimed water. Refer to this EDIS document for more information. Want to learn more about irrigation? Register here to attend a FREE irrigation workshop for both pros and homeowners! The workshop will include more information about reclaimed water for irrigation, irrigation tips and tricks, and a demonstration of the latest irrigation scheduler tools and apps. Register today before this FREE event fills up! Follow me on Facebook and be the first to hear about upcoming events.